You might be surprised by the germs in your home that Colorado Springs house cleaning services could help you with. Keep in mind these top five dirty things in your home, and be sure to give them a good cleaning on a consistent basis. When we want to clean our dirty hands we go to the sink. It’s no wonder the faucet can be can be a breeding ground for kitchen or bathroom germs. Make sure to regularly clean the faucet and handles thoroughly with disinfectant to reduce the germs spread around your home. You may throw the pot in the dishwasher every so often, but how often do you give the whole machine a solid cleaning? The water reservoir is a breeding ground for yeast and mold. 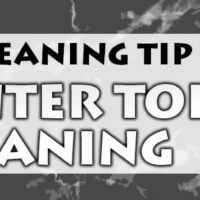 To eliminate the growth of bacteria, wipe the reservoir with a paper towel and clean it once a week by allowing 4 cups of white vinegar to sit for 30 minutes before running it through a cycle. Run 2-3 cycles with fresh water until the vinegar smell is gone. Ah, the kitchen sponge. The perfect damp breeding ground for germs and bacteria. You likely clean up any spill or mess with them while germs happily make residence in their nice, wet home inside the sponge. Sponges should be sanitized daily. You can put them in the microwave each day for 2 minutes to zap the germs, or pop the sponge in the dishwasher while running a load. Even so, it’s recommended to replace your sponge every two weeks. As an alternative, consider using microfiber cloths. Light switches and door handles experience lots of dirty hands and germs, but don’t forget to consider your stove knobs. These unsuspecting victims are the recipients of food splatter and hands that come in contact with raw meat and other food. To clean, remove them and soak in hot soapy water. Wipe down and disinfect door handles and light switches around the house to reduce the spread of germs shared among your family members. Anywhere that hands touch should receive a cleaning every so often. You likely cut meat, veggies, and more on your cutting boards and, as a result, they can be a breeding ground for germs if not cleaned properly. Consider using separate cutting boards for veggies and meat and clean thoroughly after each use. Make sure wood cutting boards are made from hardwood, such as maple, and place them in a dishwasher or hand wash with hot soapy water for extended use. Wood cutting boards can also be cleaned with salt, white vinegar, or lemon juice to get into the cracks and clean below the surface. Finish by rinsing with hot, soapy water. If you need an extra hand with Colorado Springs house cleaning services, Maid to Shine can help! Our experienced house cleaners will make your house sparkle while eliminating germs in the process. We’ll handle all the dirty work, so contact us to book. Did this help you? Post a comment and tell us about it. You can find other time saving Colorado Springs house cleaning tips from Maid to Shine here.